We try to make setting up WordPoints as easy and intuitive as possible, but sometimes it is still nice to have a helping hand. In this guide we’ll walk you step-by-step through getting WordPoints set-up on your site. Before doing anything else, WordPoints needs to be installed. If you’ve already done that, you can skip to the next step. Otherwise, navigate to the Plugins » Add New admin screen, and enter “wordpoints” in the search box. Then, click the “Install Now” button. Next, you need to activate the plugin. If you’ve just installed it, this is as easy as clicking the “Activate” button. Otherwise, just navigate to the Plugins admin screen, and click the “Activate” link in the row for WordPoints in the plugins table. 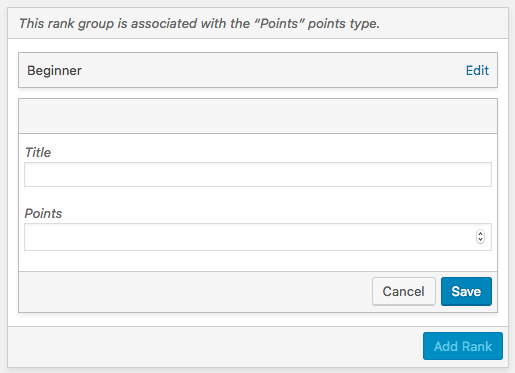 After activating WordPoints, you’ll see its welcome message, inviting you to create your first points type. Clicking the link will take you to the WordPoints » Points Types admin screen. 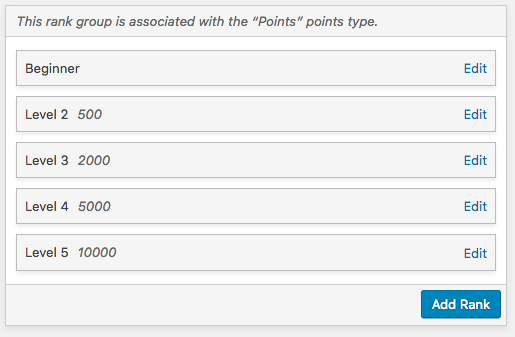 You need to enter the Name of your points type—this is what you want the points to be called on your site. For example, “Points”, “Credits”, “XP”, “Rep”, etc. Optionally, you can also provide a Prefix that will be added to points values when they are displayed. For example, a prefix of “$” will cause 10 points to be displayed as “$10”. You don’t have to worry too much about the prefix and suffix, since you can easily change them later. After you have entered the values you want to use here, you can click the Save button and your points type will be created! Changing a points type’s settings. 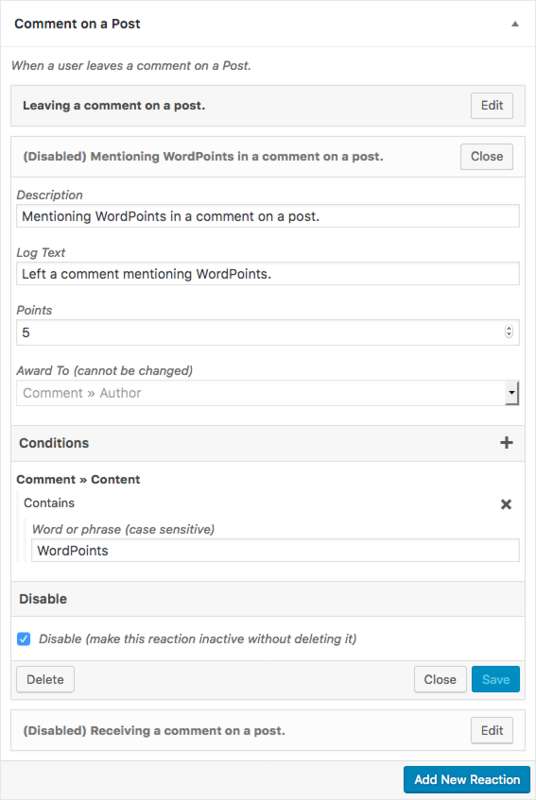 After creating your points type, WordPoints will offer to help you get started by creating some demo event reactions for you. Events represent the different actions that users take on your site that WordPoints can award points for. Examples of events are registration, and a post being published. A reaction is a group of settings tell WordPoints one way that it should respond (or “react”) when a particular event occurs. 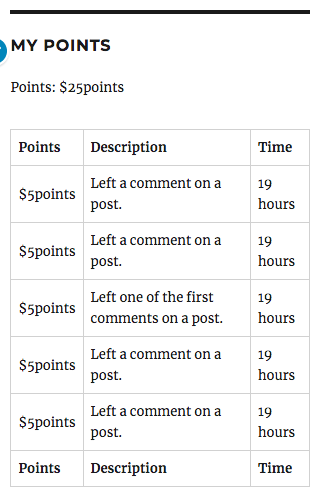 For example, a reaction can be set up to award 5 points to the post author when the Publish Post event takes place. Clicking the Create Reactions button is a great way to get started with some example demo reactions. After WordPoints has created these reactions for you, you can modify them to fit your needs. Don’t worry, they won’t start awarding points until after you have specifically enabled them by unticking the “disable” checkbox in their settings. Remember, all of these reactions are optional; if you don’t want to use one, that is fine, you don’t have to enable it (you can even delete it if you want). Let’s get started by editing the reaction for the Register event. Just click the “Edit” button in the reaction’s title bar. Description. This is a description of this reaction, and is shown in its title bar. It can also be displayed on the front end of the site, using a shortcode that informs users of all of the possible ways of earning points. (We’ll talk more about that later.) By default it is “Registering with the site.” But you could change it to “Signing up”, for example. Log Text. This is the message that is shown in the points logs explaining why the points where awarded. By default it is “Registering with the site.” But you could change it to just “Registering”, or anything else that you’d like. Points. By default, 100 points are given to a user when they sign up, but you could change this to 50 points, 250 points, or any other value that you desire. Award To. This setting determines who the points are awarded to. It can only be set when a reaction is created, so we cannot change it now. So by default, the points will be awarded to the user who registered. Conditions. 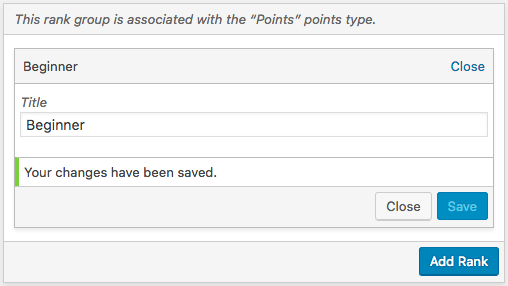 You can use this feature to add restrictions on when the points are awarded. For example, you could add a condition on the user role, so that the points would only be awarded to users with a particular role. In this case, you’ll probably want to just leave the reaction as it is without any added conditions for now. Disable. Once you are happy with the reaction settings, don’t forget to uncheck the “Disable” checkbox so your reaction will begin awarding points. Then, just click the reaction’s Save button, and your reaction will begin working! Now that you’re ready to move on, you can click the Close button to close the reaction form, so you can better focus on the next reaction you want to edit. Next, you might want to award points when users visit your site. This will help encourage them to keep coming back often! 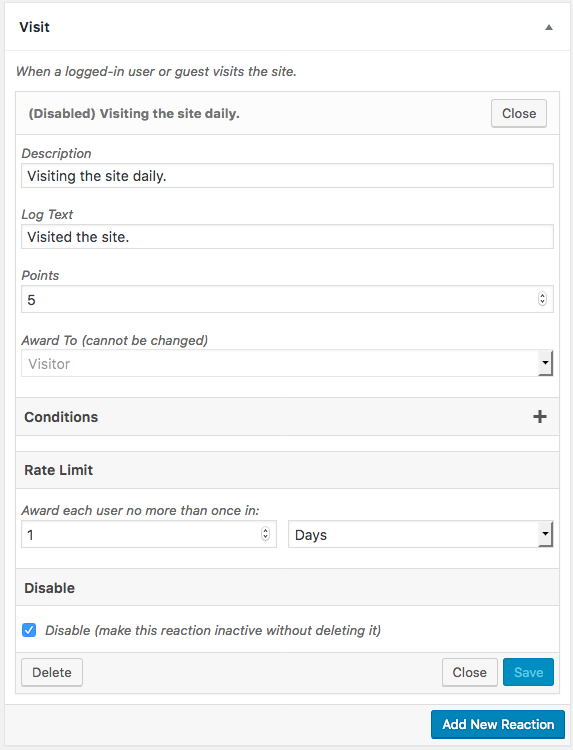 WordPoints gets you started with a reaction that awards points for visiting the site daily. This has the same basic settings as the reaction for the Register event, with one important addition: the Rate Limit options. 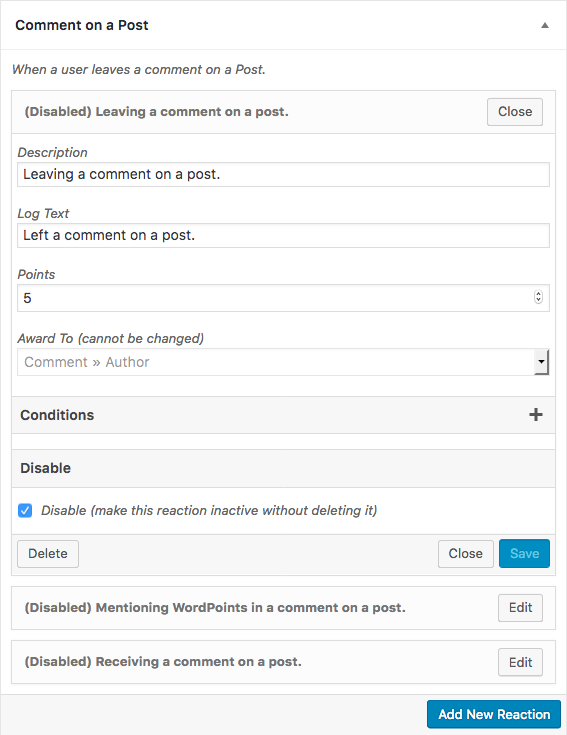 By default, WordPoints has set up the reaction to award points to each user no more often than once in a day. (If a user visits the site more than once in that time, he’ll still only be awarded points once.) However, you can change the frequency to whatever you want: 5 minutes, 1 week, 2 hours, etc. After customizing the settings, just uncheck the Disable option and hit the Save button. 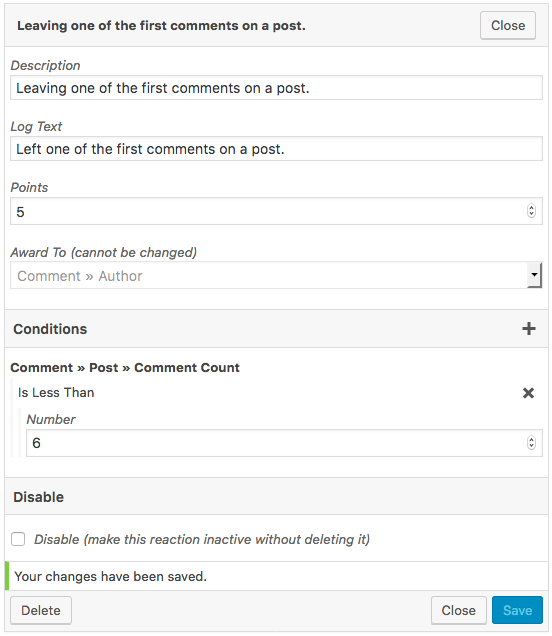 Next will set up a reaction to award points for new comments. Here again we have the same basic settings. You can customize them, untick the Disable checkbox, and click Save. As you can see, this reaction uses the Conditions settings. 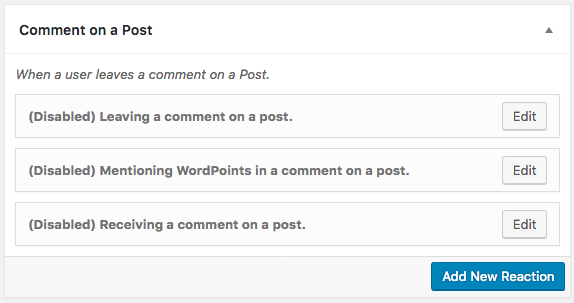 It only awards points for comments that include the word “WordPoints” in them. This is just an example though, you may not want to actually use that on your site. In that case, let’s modify this reaction to instead award bonus points just to the first few people who comment on a post. First, click the “X” button to remove the condition that WordPoints added. Then, click the “+” button. Now, in the first dropdown, select “Comment » Post » Comment Count”. In the second dropdown, select “Is Less Than”. Then hit the “Add” button. This will add a condition on the number of comments the post has received. You can enter a value such as 6 here, and then the first 5 users who comment on a post will be awarded extra points by this reaction. Later commenters will only receive points from the other reaction that we just set up. Change the log text and description to match this new condition, and adjust the points as you like. Then you can uncheck the Disabled checkbox, and save your reaction. There are additional events that you can award points for, but we won’t go through each of them here. From the above examples, you should have the general idea of how reactions work. Before moving on to the next step, you can finish customizing the other demo reactions WordPoints created for you, as well as adding new reactions of your own if you want. In addition to the events WordPoints offered by default, there are other events offered by extensions, to integrate WordPoints with various plugins. All of the events work the same way though, and offer the same basic settings, so you should have no trouble getting them all set up the way that you want them. Now that we have our basic reactions set up, let’s go to the WordPoints » Settings screen and configure the plugin’s basic settings. By default, there are just two options here. The first one is the Default Points Type. WordPoints lets you create as many different kinds of points as you want. Often though, you may plan to just use one type of points on your site, not multiple ones. 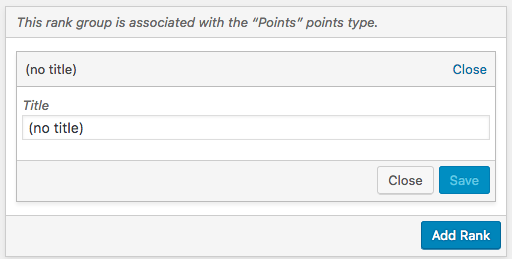 In either case, you may want to set one points type as the default. That way, in shortcodes for example, you don’t have to always tell WordPoints which points type you are talking about. WordPoints will just assume that you are talking about the default points type, except when you specifically reference a different one. 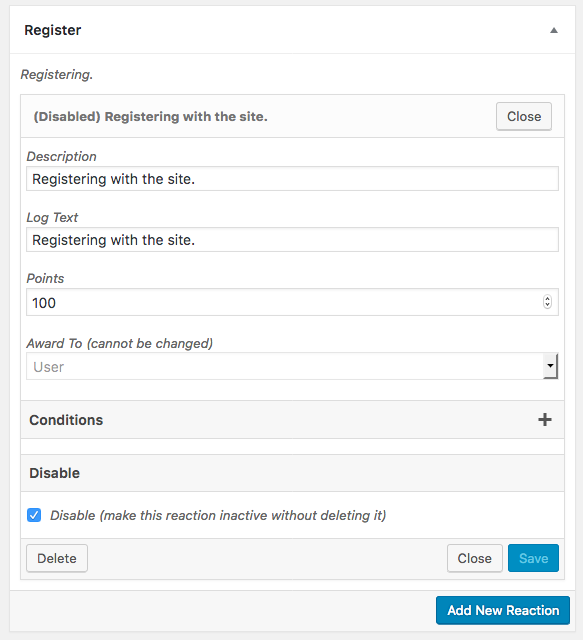 When points logs and such are displayed on the front end of your site, there may be certain users that you want excluded. For example, you might not want to include points awarded to your own admin account. You can tell WordPoints that by giving it a list of user IDs to exclude. Once you’ve filled in these settings, don’t forget to click the Save Changes button! While we are on the WordPoints Settings screen, it is a good time to decide if you want to use ranks on your site. If you do, the first step to enable ranks is to go to click on the Components and activate the Ranks component. Now in the admin menu under WordPoints you will see a link to the Ranks screen. That is where we need to go to configure the ranks. By default, WordPoints will have created the base rank for you, but it won’t have given it a title yet. Let’s begin by clicking the Edit link in the rank’s title bar, and setting the title for it. Since this rank will be the lowest one, given to users who don’t have many points, you might give it a name like “Beginner,” “Newbie,” “Level 1,” or something else appropriate for your site. Once you have filled in the title that you want, you can click the Save button to save it. You can now use the Close button to close the form for this rank, so you can focus on the next thing. The next step is to create the second-lowest rank for your site. To do that, click the Add Rank button. 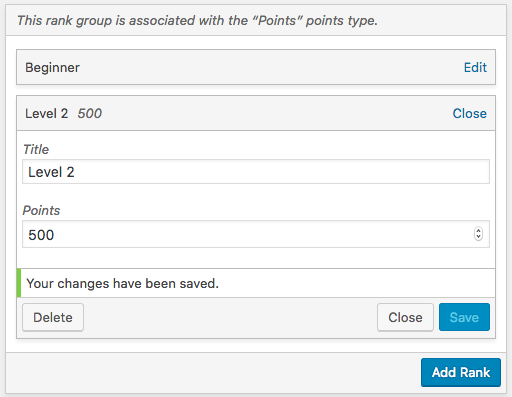 A new rank will be added to the set, with an empty title, and also a second empty setting: the number of points a user must have to achieve this rank. You can fill these out however you like, for example using the title “Level 2” and the points value 500. That would mean that only users with 500 or more points would have this rank; those with fewer points would have the previous rank. Once you’ve filled in the settings, click the Save button to create the rank. Now you’re ready to move on to the next step! Now that you have your basic points and ranks system in place, it is time to display this information to your users on the front end of your site. WordPoints provides you two different ways of doing this: shortcodes, and widgets. 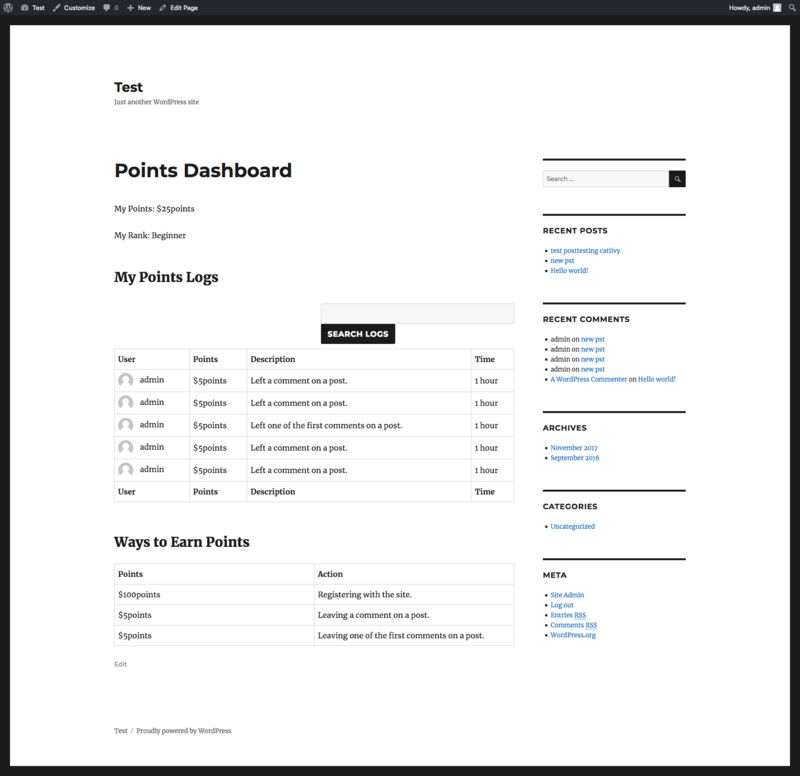 Let’s begin by using some shortcodes to create a points dashboard page for your users. 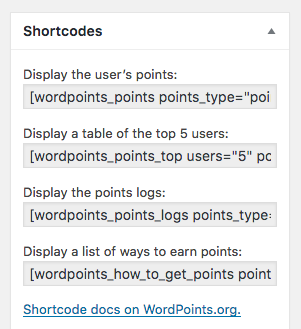 An easy way to get started is using the shortcode examples WordPoints gives you on the WordPoints » Points Types admin screen. However, below we’ve also provided a complete example page content, to make it easier for you to get started. You can copy this and paste it into the Text tab of the editor. Feel free to modify it however you want, adding additional shortcodes even. Now you may also want to display some information in your sidebar, so that users can see their points at a glance without having to go to the points dashboard. This can be done using one of WordPoints’s sidebar widgets: “WordPoints”. Click the “Customize” link in the toolbar when viewing your site. Click on the Widgets panel and then select the sidebar you want to add the widget to. Click the “Add a Widget” button, and enter “points” into the search box. Click the “WordPoints” widget to add it to your sidebar. 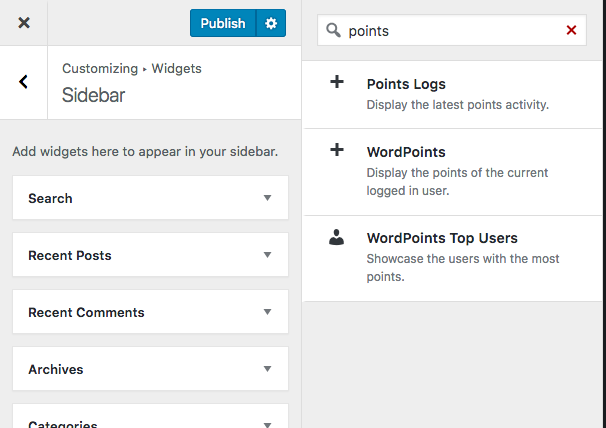 Now you can configure your widget to show the current user’s points and recent logs in your sidebar. Next, you might want to display a leaderboard of the top 10 users in your sidebar. 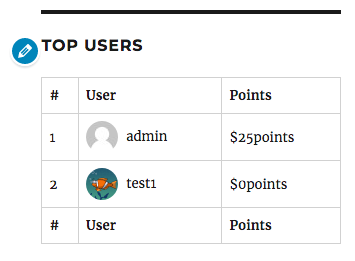 You can do that with the “WordPoints Top Users” widget. 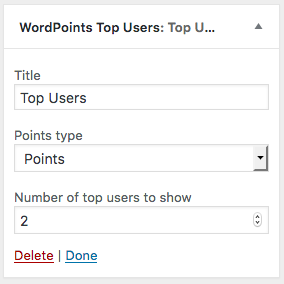 Now that you’ve got your basic points system set up, you may want to add more features using WordPoints extensions. For example, if you use a plugin like BuddyPress on your site, you might want to integrate WordPoints with it.